It was a good year for D-backs prospects, especially at the lower levels. While reliever Jimmie Sherfy was making his Major League debut and securing a spot on the postseason roster, Jon Duplantier was dominating the Minors. MLB.com's No. 73 overall prospect led all Minor Leaguers with a 1.39 ERA over 136 innings. The real kicker is that the 23-year-old was in the hitter-friendly California League for half the season. Before turning 19, Matt Tabor shined in a limited stay in the Rookie-level Arizona League, while Taylor Clarke did well at Double-A Jackson but had trouble adjusting at the end of the year with Triple-A Reno. In February, the D-backs added another talented arm in Taylor Widener, who led the Florida State League with a 1.15 WHIP as a Yankees prospect. All-in-all, Chase Field could host to a stacked rotation in a few years. Like the D-backs, the Red Sox have a relatively young system, with six of their top eight pitching prospects turning pro in the past two years. From the 2016 Draft class, No. 2 prospect Jay Groome was rattled by injuries last year, while Mike Shawaryn ranked among the Minor League leaders with 169 strikeouts and 2016 signee Bryan Mata shoved as the youngest player in the South Atlantic League at 18. Following the 2017 Draft, Tanner Houck and Jake Thompson led the Class A Short Season Lowell rotation as Alex Scherff focused on resting his arm. Southpaw Jalen Beeks represents the organization's closest arm after fanning 155, advancing to Triple-A and being named the Red Sox Minor Leaguer Pitcher of the Year. Considering the Marlins' offseason, it's no surprise many of their top arms came from trades, including Sandy Alcantara, Jorge Guzman, Nick Neidert and Zac Gallen. Alcantara and Guzman, as well as Edward Cabrera, possess fastballs that grade well-above average, with former Yankees prospect Guzman's being the most touted. In terms of homegrown talent, 2016 first-rounder Braxton Garrett underwent Tommy John surgery last June, 2017 first-rounder Trevor Rogers did not pitch after the Draft and Dillon Peters missed three months with a thumb injury. Peters made his Major League debut in September, though, and is competing alongside Alcantara for a rotation spot in Miami. The Twins' top pitching prospects have had to overcome their share of adversity, but fans can take comfort in how well they seem to bounce back. Minnesota's top Minor League arm, Fernando Romero, missed parts of 2014 and 2015 following Tommy John surgery but has flashed his well above average fastball since. Stephen Gonsalves had his 2017 season delayed by a shoulder issue but advanced to -- and did well at -- Triple-A once he returned. Brusdar Graterol had Tommy John surgery in 2016, while Lewis Thorpe missed 2015 after the procedure and 2016 with mononucleosis. And Zack Littell has been traded twice since the 2016 season. All that being said, they notched sub-4.00 ERA's last year. The Indians do not have a lot of pitching depth in the Minors, but they do have Triston McKenzie. MLB.com's No. 24 overall prospect -- and ninth-ranked right-hander -- ranked second in the Minors with 186 strikeouts while issuing 45 free passes over 143 innings for Class A Advanced Lynchburg. And most of that happened before he turned 20 in August. The 2015 competitive balance pick earned a trip to the All-Star Futures Game as he continues to add speed to his fastball. Joining McKenzie on the Hillcats staff that led the Carolina League with a 3.21 ERA were Shane Bieber and Aaron Civale, both of whom were selected in the 2016 Draft. The pair combined for 303 punchouts and 24 walks -- an impressive 12.63 K/BB. Most of the Brewers' best pitching prospects are in the heart of the Minors, with Corbin Burnes, Luis Ortiz, Freddy Peralta, Marcos Diplan and Cody Ponce pitching for Class A Advanced Carolina and/or Double-A Biloxi last season. That should mean callups this and big league proving time in 2019. However, Brandon Woodruff and Adrian Houser could make waves sooner. The former made his big league debut last August after shaking off a hamstring injury, while the latter returned from Tommy John surgery in July before a stint in the Arizona Fall League. Houser got a cup of coffee in 2015 and will look to resume that momentum this season. While two-way players were all the rage last year with the Rays drafting Brendan McKay and the Angels signing Shohei Ohtani, Reds first-rounder Hunter Greene put his bat away to focus on pitching. And with a fastball that grades an 80 (on the 20-80 scale) and touches triple digits, there's still plenty to be excited about. Tyler Mahle, the organization's other Top-100 prospect, enjoyed a big 2017 that featured a Southern League perfect game and his Major League debut. After repeating Class A Dayton, 2015 second-rounder Tony Santillan got back on track, while Vladimir Gutierrez will look for his own rebound after a tough full-season debut. Jimmy Herget is looking for a spot in the Cincinnati bullpen after leading the farm system with 25 saves in 31 chances at the upper levels. Like the Reds, the Pirates have two big names about whom fans should be jazzed, as well as some other noteworthy arms. Following Tyler Glasnow's graduation from the prospect rankings, Mitch Keller -- MLB.com's No. 15 overall prospect -- shook off a back issue and shined on the way to Double-A Altoona. Meanwhile, in his pro debut, 18-year-old Shane Baz put his five-pitch arsenal on display in the Rookie-level Gulf Coast League. Taylor Hearn battled an oblique injury, joining Keller in the AFL to end the year, while Nick Kingham put an ankle injury behind him to pitch for Triple-A Indianapolis. Although he earned a trip to the Futures Game, Luis Escobar continues to work on control issues at the lower levels. Two years ago, Sean Manaea was the A's only big pitching name. Now he's in the Oakland rotation and the farm system has four potential aces in the pipeline. With a well above average fastball, 2016 sixth overall pick A.J. Puk is the Minors' No. 2 southpaw, earning a trip to the Futures Game and a promotion to the Double-A Texas League in his first full season. The A's picked up Grant Holmes from the Dodgers in 2016 and last July got lefty Jesus Luzardo from the Nationals and righty James Kaprielian -- who's coming off Tommy John surgery -- from the Yankees. Puk and Holmes should see time in Oakland this year, while Kaprielian could follow in 2019 and Luzardo a year later as a succession falls into place. If there was any doubt, the Tigers are officially a pitcher-heavy system. Detroit's top four prospects are all right-handed hurlers -- they're the club's only entries in the Top-100 -- and six of the system's top eight prospects are pitchers. 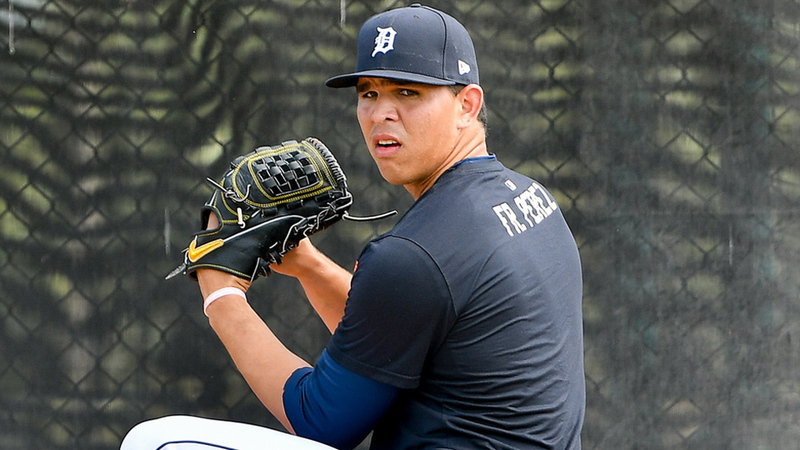 Franklin Perez came over in the Justin Verlander trade and has a shot at being the team's next ace, reaching Double-A at the age of 19. The Tigers have been cautious with first-rounders Matt Manning (2016) and Alex Faedo (2017), but the pair should log plenty of innings this season. Rounding out the Top-100 quartet is 2015 first-rounder Beau Burrows, who excelled at Class A Advanced but found the adjustment to Double-A difficult, though it probably won't be long before he figures out the level. His Florida State League teammates, Kyle Funkhouser and Gregory Soto, dominated with the Flying Tigers. With all those arms, fans in Motown should be able to dust off their highest hopes.